High atop a cliff jutting into the clear, deep waters of Lake Superior, the Big Bay Point Lighthouse beckons adults in search of a secluded retreat from modern life. This unique bed-and-breakfast inn is one of the few surviving resident lighthouses in the country and is listed on the National Register of Historic Places. 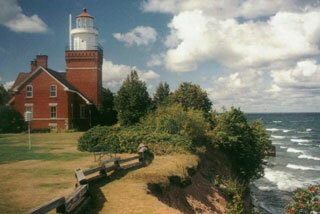 For over a century, mariners have relied on Big Bay Point's light to guide them along this remote and rocky stretch of Michigan coastline. Although automated in 1941, the romance and lore of the site are undimmed. 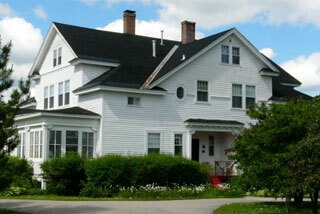 The Celibeth House was built in 1895 by William Mueller as his private residence. Over the years, the house has served as a private residence, tavern and since 1987 has been operated as the Ceilibeth House Bed and Breakfast. An enclosed front porch hosts a game table and several chairs for relaxing, reading or just enjoying the quiet of the north. Our living room is another place to sit and enjoy a good book. We have a small library housing numerous books on early American history, country living, decorating and as well as a variety of other subjects.